A lot of couples especially the soon-to-be brides, have a lot of ideas on what they want for their wedding day. “Floral arches for a garden wedding, or a fancy theme to go with it, maybe dinner for the families at a swanky restaurant, but a lunch for the friends is good too,” these are the considerations that will never leave these young couples but then reality strikes in. Where are they going to get so much money for so many things? 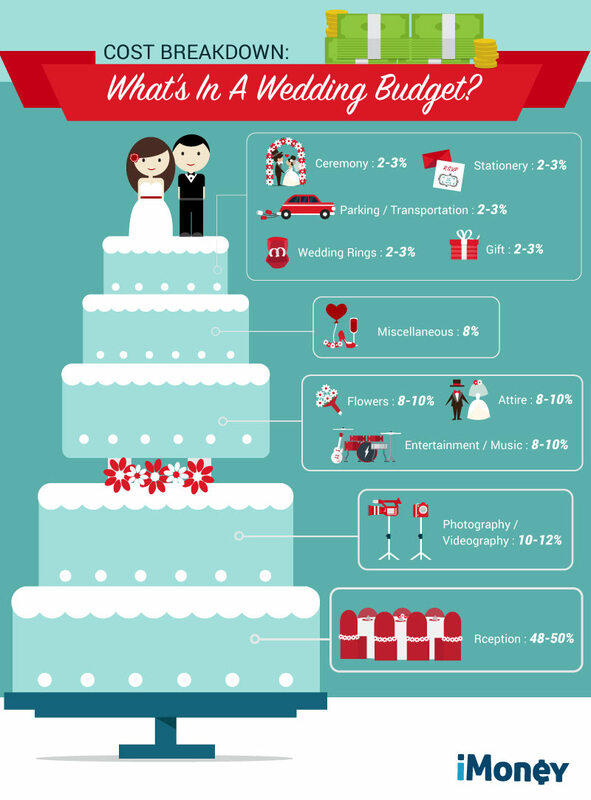 It all comes down to budgeting and good planning where couples CAN have a wedding that does not need to cost a bomb. It also takes some discipline too, because couples tend to want a lot of things that might not be so important for the wedding. Also, if you plan to make your wedding a stand out among the weddings of other friends, forget about being money conscious because to ‘compete’, couples will definitely need to fork out a lump sum to make the wedding unique and special. Today, we will be sharing on how couples can save their pockets by budgeting and planning accordingly to what they truly need on their big day. She wants a regal theme for the wedding, he wants a rock and roll theme, so they decided to make it a royal rock and roll theme which is going to burn a deep hole in the pockets as the decorations for the venue and displays itself will be a burden if not planned properly. It is however advisable for couples to set a budget first before proceeding to the planning. A budget can snap these couples back to reality for they will be clear on what they want or can expect from the budget they have decided for their wedding. It is bad when you start arguing with your other half over money matters that involves the wedding. Both the soon-to-be husband and wife are newbies in this wedding business and are lost in the massive sea of choices. So here comes the wedding planner to the rescue. Wedding planners can help couples to locate florists, restaurants, photographers and all the other elements of a wedding within the budget given. However, wedding planners are hired and the prices for their services depends on the types of package the couples choose which will also costs a sum of money. If you do not plan to spend on a wedding planner, then be the wedding planner yourself! Couples can visit our site, Wedding.com.my to compare prices among different vendors for the best price so that they can spend within their budget. Do not fret if you have a budget but cannot make up your mind on what you want. Couples can browse around the site to gather ideas and inspirations for their wedding. Wedding.com.my also has a STORY section that allows couples to read about real life weddings and featured vendors which might simply give you a gist on what you can do for the most important day of your life! Many couples these days prefer the modern wedding style but are still open in incorporate the traditions of their heritage in the wedding ceremony. In this case, Wedding.com.my displays and connects vendors that are relevant for Chinese weddings, Malay weddings, Indian weddings and so on. This localized concept is a hit among those who browse the site and have plans to do a fusion of modern and traditional type of wedding. For adventurous couples, Wedding.com.my is the bridge for them to connect vendors from other regions in Asia which includes China, Singapore, Thailand and Taiwan. With a wide range of vendors providing wedding related items, products and services, Wedding.com.my is the go-to site to make sure you have all you need for your wedding day! After narrowing down on which vendors you are interested in to collaborate with for your wedding, you worry about the quality and is afraid that you will not be getting what you paid for. No worries, Wedding.com.my allows you to read reviews on the site to evaluate and make decisions on whether to proceed in contacting the chosen vendors. After confirming what you want for your wedding, you can pay with the easy payment options at Wedding.com.my which includes Visa, Mastercard, Maybank2u.com, Paypal, CIMB Clicks and RHB Now. Vendors contacted and the services confirmed, payments settled, now it’s time to sit back and enjoy your wedding to the fullest. It feels even more satisfying when you and your better half work together to handle the whole wedding! Weddings can really stress out many couples because of insufficient funds to do what they want. Therefore, set a budget and plan your wedding with the person you love and we can guarantee that your wedding will be a truly memorable one! Visit Wedding.com.my for everything you need to plan your dream wedding!